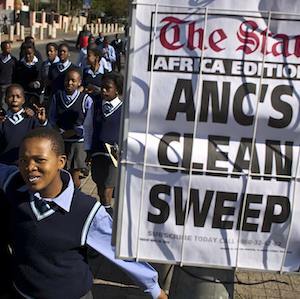 With the May 2014 elections done and dusted, South Africans are now turning their attention to prospects for the municipal elections in 2016, the candidatures for a new president of the African National Congress (ANC) – and eventually the country – in 2017 and the national elections in 2019. An update of an earlier forecast of South Africa’s political fortunes would see the ANC most likely remaining the governing party, even by the 2029 elections – although with a wafer-thin majority. Provincially, either the ANC or the Democratic Alliance (DA) – the official opposition – should be able to form a governing coalition in the Gauteng province after 2019, with neither party able to gain an outright majority. Eventually, control over the economic heartland will prove decisive. Commentators generally agree that the outcome of the recent elections could see substantial change and potentially important shifts in party-political support, but these may take longer to play out than most would expect. Beyond the country’s economic fortunes, key determinants are expected to be the evolution of the young, urban black vote; voter apathy among older voters; the launch of a left-wing political party by the National Union of Metalworkers of South Africa (NUMSA); reform in the ANC (including leadership succession) and the continued momentum of the DA. In February, the Institute for Security Studies (ISS) outlined four broad scenarios for South Africa up to 2030, namely ‘The future is ANC,’ ‘The rise of multiparty democracy,’ ‘Bafana Bafana,’ and ‘A nation divided.’ These scenarios sketch possible outlooks for the economic and political future of the country, and used the International Futures forecasting system to quantify the impact of each pathway on economic growth, poverty, health, carbon emissions, the delivery of social services and South Africa’s global position. The government’s National Development Plan (NDP) featured prominently in these forecasts. A possible high-growth road was premised on the determined implementation of the plan, while the low road would result from the abandonment of the NDP and the emulation of populist policies that provide short-term benefit, but at considerable long-term development costs. The current trajectory of the country is termed Bafana Bafana, after the lacklustre national soccer team. This is the story of the perennial underachiever. It is reflected in the appointment of a bloated cabinet shortly after the elections, which saw existing departments being divided into even smaller components in the interests of political expediency and an inability to commit, in all its complexity, to the true spirit of the NDP beyond rhetoric. Although the average growth forecast of 3,8% to 2030 under the Bafana Bafana scenario is not bad by comparative middle-income standards, it would be grossly inadequate in responding to the country’s triple challenges of unemployment, poverty and inequality. It is also significantly lower than that of Africa, the rest of the South African Development Community (SADC) in particular, which is expected to grow at an average rate more than twice that of South Africa. The golden legacy of former president Nelson Mandela is slowly slipping from our grasp. In 2007/8, the global financial crisis could be blamed for South Africa’s lacklustre growth. Now we have only ourselves to blame. The results of the May elections now provide additional data to firm up the different scenarios on party-political support for the ANC and the DA that the ISS published in April. The most likely development (named ‘Bafana Bafana’ – see graph) would lead to the continued, steady decline of ANC support at national level, from 62% in 2014 to an estimated 50% in 2029. Support for the DA can be expected to grow from its current 22% to roughly 40% during the same period. 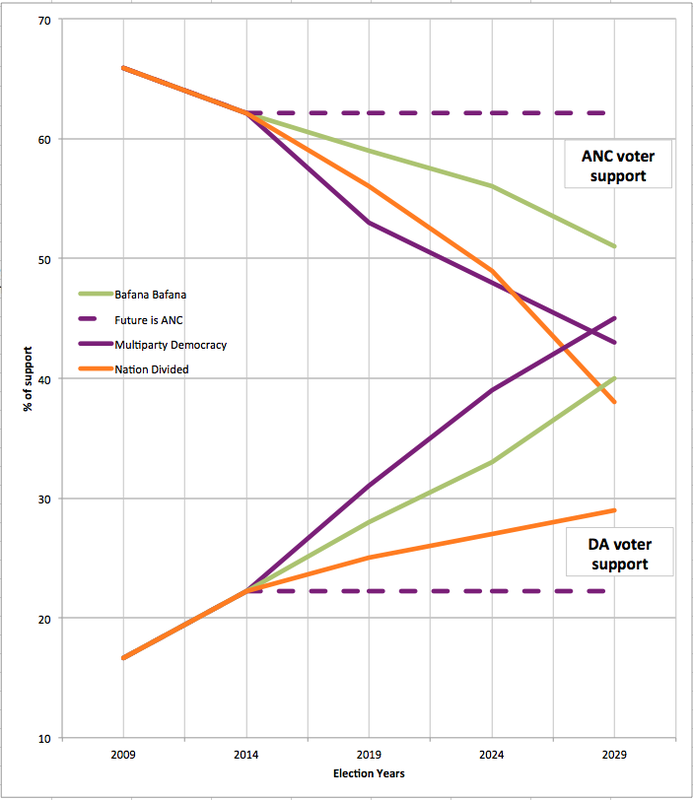 The ANC could dip below 50% of voter support under two scenarios during the 2024 elections. Under the ‘rise of multiparty democracy’ scenario, premised on a growing and dynamic South African economy largely through private-public sector partnerships, the DA does better than expected following further evolution at leadership and policy level. Under the ‘nation divided’ scenario, premised on dismal economic performance and an associated fractious society, the DA remains the official opposition and other parties to the left of the ANC steadily gain support. While developments at national level will probably evolve slowly, things could be quite different at the local and provincial level – where the DA is expected to do relatively well in 2019, particularly in capturing additional support in Gauteng and possibly the Nelson Mandela Bay metropolitan municipality. It is unlikely that the DA will obtain a majority in Gauteng province in the 2019 national and provincial elections, but the ANC is generally expected to win less than 50% support, requiring it (or the DA) to rely on a coalition to govern South Africa’s richest province. It would be surprising if the DA did not succeed in unseating the ANC in Gauteng in 2024, and if the ANC did not also lose substantial support in provinces such as the Northern Cape and North West. The loss of Gauteng, the epicentre of the country’s economic activity, may very well accelerate the ANC’s decline nationally and provincially and boost DA chances, leading to a heavily contested election and interesting result in 2029. The future of other parties, the Economic Freedom Fighters (EFF) in particular, is difficult to forecast. The prospects of the EFF are closely tied to the fortunes of its leader, Julius Malema, and his charismatic and innovative style of politics. Other parties such as the Inkatha Freedom Party (IFP) and the National Freedom Party (NFP) are likely to remain regional parties. The IFP is already in decline and it is doubtful whether the NFP can translate its regional gains into national appeal. The space to watch here is the dynamics between the EFF and a left-wing party that NUMSA intends to launch. This could draw support away from both the ANC and the DA, but impact quite seriously on the fortunes of the EFF. Despite its considerable potential, South Africa is struggling to make economic headway. The most recent downgrade of South Africa’s sovereign rating by Standard & Poor’s and other international rating agencies is a shot across the bow for the country. Given the scenarios sketched out here, developments within the ANC are key determinants of South Africa’s growth trajectory. The policies that the party sets, and the leadership it provides, are important for all South Africans and will be keenly watched across all sectors of our society. The governing party is often accused of speaking left and walking right. The reality is rather that of policy contradiction and a lack of clear direction, with one set of policies regularly offsetting the potential benefits of another. The recent regulations on immigration are an example. Reflected in our forecast of an expected 'Bafana Bafana' pathway, this is a future where commitment to the NDP is largely rhetorical, while actual government policy (and poor capacity in government) remains a drag on employment creation and growth. We need much more in terms of sustainable job creation, good governance and the quality of leadership – and the ANC should seriously reflect on the country’s realities, and those of the party itself, to determine how it can best meet these ambitions.